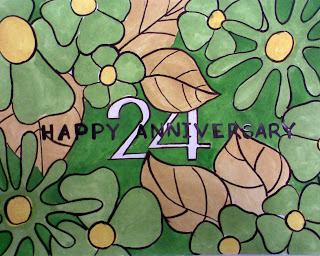 How to make your parents a greeting for their 24th anniversary? Then you find more of the same picture by searching for sony vaio 10th anniversary edition. You then sit at office for three hours on a Saturday night and paint on a piece of card that you found lying around at the printer. Meanwhile, you've replaced the VAIO with a 24. Having finished painting, you fish around for a camera phone from one friend and a data cable from a colleague of another friend, and get a digital copy of your 'work of art'. In my defence, the cameraphone does not do my actual work enough justice. The colors came out much better than what the image shows. Then you find a nice envelope at the small stationary near your flat, put your card in and seal it up. The next morning you go to the courier and find that the only courier in your area is off on a holiday. You make sure of the fact by actually walking over to his house and checking that the door's locked. But you don't give up and the morning after that, drive over to the courier near work and hand it in. And with a tracking-id in hand, you track your envelope all the way to your home. And add in a couple of phone calls to the courier office at Vijayawada to make sure that they've indeed received your mail and that it's out for delivery. Finally, you be childish to the point of stupidity and call up your parents to make sure they've gotten the card and have them say that it's nice.